After making fun of your friends and other people on April Fool’s Day on April 1, you have another chance to project yourself as a fun loving guy. Yes, Tell A Lie Day (April 4). This is the day when you can tell a lie without any guilt. The day is all about celebrating some lighter moments in your life. But that does not mean that the day is encouraging you to speak a lie. It is simply a fun activity to maybe break the monotony of our daily life. If you want to celebrate lying and trickery, Tell A Lie Day 2019 is just a perfect excuse to let those suppressed lies come out of your chest. So, be prepared to tell all sorts of lies throughout the day on April 4. The day is somewhat an acknowledgement of the fact that lying is very much a part of life. Right from our childhood days to the far end of life, we do hide the truth from our friends and relatives in many ways, and we regret that. But this is the day of fun where telling lye is a guilt-free activity. Looking For Custom T-Shirt Printing? It’s very simple. Choose a t-shirt. Select color and size. Choose from thousands of ready-to-use designs. Create your own design. You can also hire a designer to get a design for your t-shirt. Another aspect of lying is white lies. Perhaps, white lies are the only accepted form of speaking something that is not true because you want to make others feel better. This kind of lye is acceptable in most religions, societies, and cultures. Then there are honest lies that are the untruthful statements that people make with no malicious intent. There are, in fact, very interesting truth about lying. To just have fun and celebrate the day, many people use T-shirts to write down those lies. You can display some of your favorite quotes regarding lies on April 4 Tell A Lie Day. But why so many people lie? We usually do not know why people lie. But according to the psychologists, some psychological conditions compel us to lie. There are basically two types of people who tell a lie. They are either sociopath or compulsive liars. A sociopath has some fixed target in mind with the intention of getting what he or she wants. Such a person speaks a lie without worrying about its consequences for others. A characteristic of such people is that they are self-centered and notoriously charismatic. At first appearance, they seem to be nice people with no trace of negativity. Compulsive liars are those who have formed this habit of telling a lie every time. They started by speaking something false just to protect themselves. Later, they picked it up as a habit. Later on, with the time, they become obsessed with telling things wrong and they cannot simply speak the truth. Then, they start speaking lies even when not required. They are not cunning, neither are they charismatic people. How To Celebrate This Day? There is no intention of turning people into habitual liars when celebrating the Tell A Lie Day. The sole intention is to just enjoy and make fun about people. Here is what you should be doing on April 4, Tell A Lie Day. 1. Play harmless tricks on your friends, colleagues, and family people. 2. Come out with some false stories about anything you can think of and tell them to people. 3. Buy t-shirts that have lies written on them for the day. 4. You can also play some bluffing games. 5. Know more about the psychology of lying and read tales that warn you about the harms of lying and deception. T-shirts are popular casual wear. But these clothing have also become a way to give expression to opinions on different issues. In fact, T-shirts are an effective marketing way to promote products or services. All a marketer needs to do is to create a logo and print it on T-shirts for brand promotion. 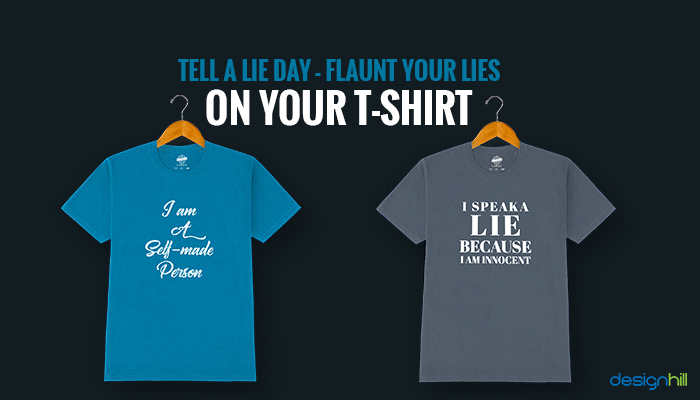 On Tell A Lie Day 2019, you can use T-shirts to print some funny lies on them and walk around your place wearing the shirts. Just make design your own T-shirt with some lies written in bold letters so that everyone can see from a distance. Or, you can buy readymade T-shirts that have the lies designed on them. If you do not know how to design your T-shirt, do not worry. You can always use a design software that lets you design on your own. You need to drag colors, fonts, etc elements into the design frame to create the shirt. Such software is available free online. Alternatively, you can hire a designer who understands T-shirt designing and printing. Just brief the designer about your slogan and design needs to get the work done in a few days ahead of the day. But if you design it on your own, you need to take care of the printing as well. To reduce your T-shirt printing cost, keep the text simple and short. Use very few, one or two colors. Avoid using a detailed design that increases the cost. You can speak something about your own lies. You surely spoke many lies during your life and you remember them. Often, these lies are simply innocent in nature and not so offending to people. You can share those false statements of yours with others on your T-shirts. But a problem with it is that when these lies appear on T-shirts, they may not look like a lie due to the lack of context. But some lies are evidently clear to the viewers. For example, if you are a thinly built person and the T-shirt you wear says that you won a wrestling match recently, it is a visible lie. So, write something that people can pick as a lie. Another trick to make people believe that something written on your T-shirt is a lie on the Tell A Lie Day is say something egoistic. For example, after you create your shirt with T-shirt maker, print the line saying that you are the only honest person around there. Or, people are getting lazy and you are an exception. 1. Do not preach me, I am the only hard working person here. 2. Depend on me even when you do not believe yourself. 3. I speak a lie only on Tell A Lie Day. 4. I speak a lie because I am innocent. 5. I am a self-made person. 6. I would have been a great soccer player. 7. Make yourself proud by making me a friend. But if you want to print something that is universal about telling a lie on custom T-shirts, then here is what you can think of. You can write these famous quotes about lying. You can use these quotes even for Tell A Lie Day 2020. 1. Tell a lie once and all your truths become questionable. 2. The reason I talk to myself is that I’m the only one whose answers I accept. 3. I lie to myself all the time. But I never believe me. 4. It is amazing how complete is the delusion that beauty is goodness. 5. There are three types of lies — lies, damn lies, and statistics. 6. If you do not tell the truth about yourself you cannot tell it about other people. 7. A truth that’s told with bad intent beats all the lies you can invent. 8. It is better to offer no excuse than a bad one. 9. If you tell a big enough lie and tell it frequently enough, it will be believed. 10. When the truth is replaced by silence, the silence is a lie. 11. Anything is better than lies and deceit! 12. Man is not what he thinks he is, he is what he hides. 13. Oh, what a tangled web we weave…when first we practice deceiving. 14. History is a set of lies agreed upon. 15. The best lies about me are the ones I told. So, take advantage of the Tell A Lie Day. Do what you normally don’t like to do, which is to speak a lie. Use the day for fun activities with your friends. Everything you speak will be just an expression of your light mood. But hire a freelance graphic designer so that the shirt design is attractive and unique. If you want to print those funny Tell A Lie Day 2019 quotes on T-shirts, you can outsource the work to Designhill. It is a leading marketplace where hundreds of designers are willing to work on your project. They will design as per your brief and come out with some really exciting design ideas for your T-shirts. Tell A Lie Day is the day when you can speak a lie just for fun without any guilt. One of the best ways to enjoy this occasion is to print something quirky about lying. You can write about your personal experience. Or simply print some quotes from famous personalities about lying.